Chapter 7 is about claims of antigravity based on the Electrogravitational Theory, which is not necessarily correct. It is stated that moving electrical charges are the cause of gravity, and that it is as such only a residue effect. Electrons are the key to what we call gravity. It is argued that because the Earth possesses more electrons than the moon, that the Earth is heavier than the moon. These are but the basic tenements of the theory. I disagree with this theory for many reasons. Photons are spin 1 particles and gravitons are spin 2. They are hence not the same. Neutrinos interact weakly with gravity but have no charge and are not composed of other particles that do have charge (such as neutrons). Gravity therefore cannot be residue. Yamishita is the scientist whose experiment will be discussed. His device consists of charged a rotating cylinder with components that weighed 1300g (1.3kg). The four primary parts were: base plate, electrode, rotor, and electric motor. He was far more specific in his experimental setup than Podklednov, with rotor dimensions given exactly as were most equipment used, and with the exact number of RPM’s (3,000). However, the dielectric (non-conducting-insulator) material used was not specified. In his unreproducible experiment, by use of Van de Graaf generator, he reduced his device’s mass by 11g (the machine is accurate to within 1g). By reversing the polarity of the electrical input, he increased the mass of the machine by 4g. The weight loss was very significant, being 1%. A first attempt was made to replicate his experiment with a motor that was capable of 19,500 RPM. The motor used was different, as was the dielectric material, but that shouldn’t matter. This is because if the claims are true, the concepts at work should be the same. The book was very specific as to what they used, naming nearly every part’s dimensions and product name. 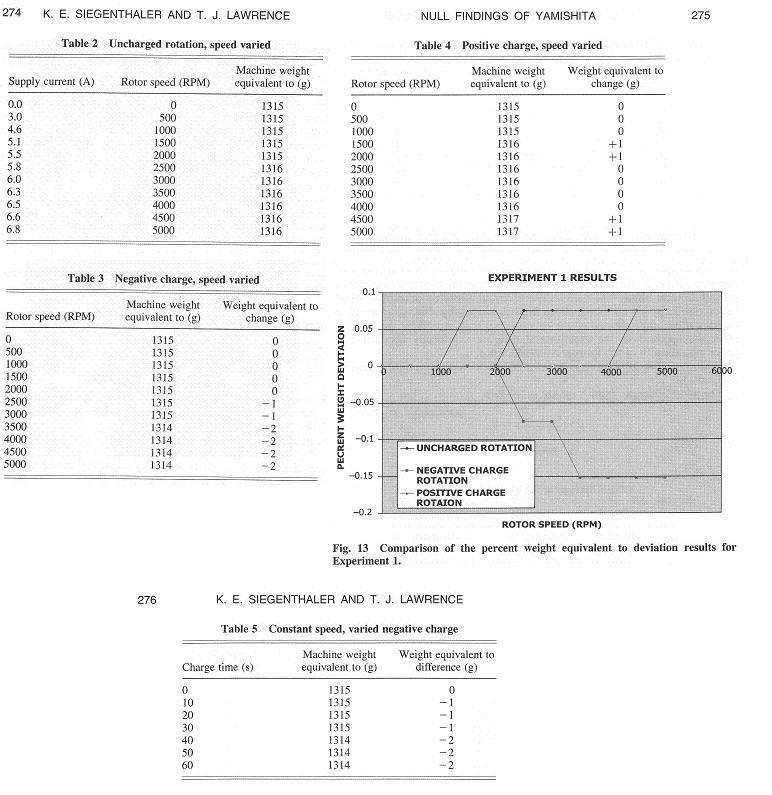 This test allowed for a third degree equation to be built comparing rotor speed and supply current. Note that the motor used couldn’t spin backwards like Yamishita’s. Every precaution was taken to see that the scale was accurate, and that the spinning inside the machine wouldn’t alter the scale (before the electrical current was added). Tests were initiated every few seconds with the machines being charged for a few seconds (in intervals). The results match the title of this chapter. Changes in weight were between one and two grams out of 1,315 grams. Various experiments were done with electrical charge and RPMs. Note that this first experiment was done at the Air Force Academy. This analysis is not sufficient enough to debunk Electrogravitational Theory, as the results are not statistically significant enough. Furthermore, the motor used in the experiment broke after one of the last tests. The second test performed was by a separate group. Its goal was twofold. 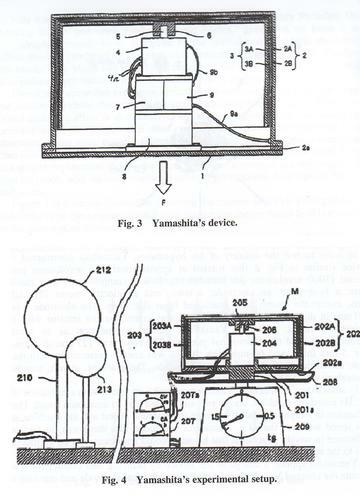 The first goal was to repeat the experiment of Yamishita, and the second was to discover why the motor in the first experiment malfunctioned. The reasons for motor damage may discredit the last experiment. The motor was dogged by lack of balance issues. At first, the paint was blamed, but that was proved to be false. The hole designed for motor shaft interface was off center too. As for the motor mount, it wasn’t properly secured. The electrode didn’t fully enclose the rotor (yet another hole). It is important to know that the experiment two had funding issues. Parts were improvised and the device looks like…not good, but it functioned properly. Motor shaft problems were discovered, but fixed with colloquial methods. The motor was far slower than the one used for Air Force Academy trial, but it still met Yamishita’s requirements. So the experiment went forward. As an insulating material, the machine used a different dielectric material (Vanguard Class F Red VSP-E-208) than in the first experiment (which used Xylene), and weighed almost twice as much. Because of this, the results could have been inaccurate (didn’t follow Yamishita’s procedure fully). The results of this experiment weren’t statistically significant. The weight of the machine varied between 2584.99 and 2585.56 g (with variation due to reliability issues pertaining to the scale). When the machine was turned on weights varied by .01 to .03 grams. There were some errors with the positive charge test (i.e., the test apparatus was touched during operation), but the weight change was so little that it is impossible to prove Yamishita. Details will not be elaborated on for this test, as the machine was in no way like Yamishita’s (shape, etc.). This second experiment at the Air Force Academy is classified as inconclusive, just like the first. The equipment and tests were not sufficient. Yamishita’s idea has been ruled out for propulsion, as it would take 830 years to get to Mars from Earth with a 500kg craft with the method provided by him. It does merit more research, but not for propulsion. A final note is that a negative charge through the pseudo-Yamishita machine produced a slight mass loss, and a positive charge made for a slight mass gain. However, these results are too tiny to be statistically significant.